Building 3 Waltham Office Center office building by Miller & Favazzo Properties - quality real estate development and property management. 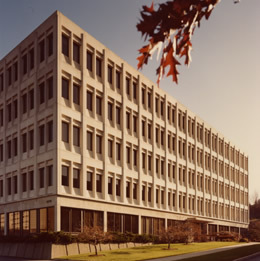 This building was completed in 1970 and was the final phase of the Waltham Office Center. The building was designed by a local architect, Fenton G. Keys Associates, and incorporates 125,000 SF of office space. The exterior façade features deeply recessed windows set in a white precast concrete panel system.